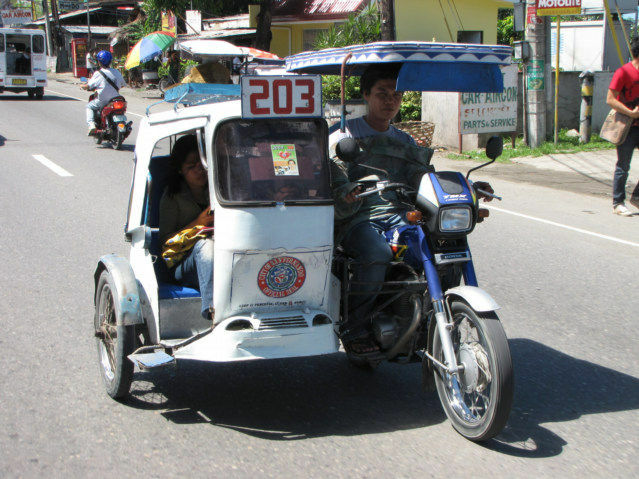 It doesn’t take more than 5 seconds on a jeepney to imagine the kind of environmental improvement that could be made through efficiency gains in the Philippines. The switch to gas from coal, for example. Or even installing 4-stroke (as opposed to 2-stroke) engine in the uncountable trikes which zip about this country like great swarms of motorized bumblebees. 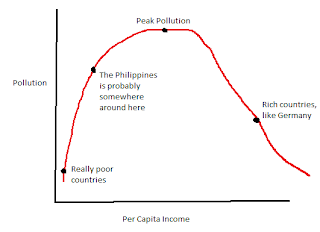 This is precisely the thinking behind what is known as the Environmental Kuznets Curve (EKC), which posits that all economies follow a pre-determined roller coaster ride of relative pollution levels. 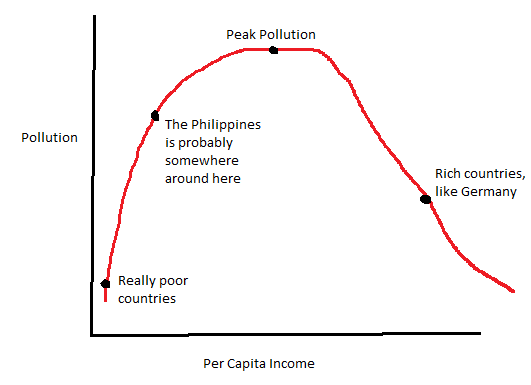 Beginning at a point of relative poverty, a developing country’s pollution levels increase until, at the top of the bell curve, greater efficiency, concern for environmental degradation, and the cost of pollution abatement relative to the utility of continued pollution combine to bring about a cleaner economy. Having one’s environmentally-sustainable cake and eating it too. But I would be remiss not to point out that, as a Westerner, I have an enormous vested interest in this outcome. Like the children’s game “King of the Castle” there’s not room for everyone at the top of the pollution curve, and a source of much climate negotiation disagreement has been the disinclination of those on top to either step down from their perch or help others up. Let’s daydream for a moment, and pretend that, since I’m in the development field, I might actually be able to help the Philippines develop (momentarily leaving aside the larger question of whether that would be an inherently good thing). 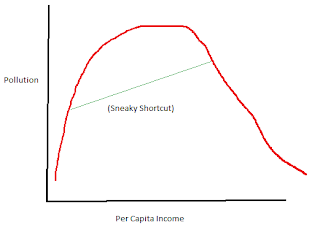 If I succeed in my ultimate goal, I will eventually be clotheslined by the fundamental problem facing international development: if the EKC represents an inevitable path, then it is almost certainly also true that not everyone can become “developed”. What happens after I single-handedly raise the quality of living of the Philippines’ population of 90 million to become equivalent with that of, say, Oakville, Ontario? And then, since I’ve apparently acquired God-like powers, I move on and do the same for China’s 1 billion people. Now we have a good chunk of the global population perched on the top of the castle, enjoying the equality that one cannot – in good faith – say that they do not deserve. 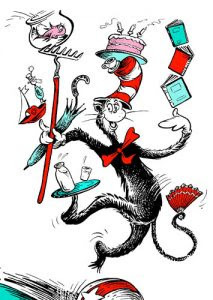 Here we take our lesson from the eminent philosopher Seuss, whose hatted cat clearly demonstrates the unsustainability of massive balancing acts. Given that the NGO for which I work has the word “sustainable” right in its name, I feel that professional considerations alone should be enough to give me pause before flicking my magic wand in that particular direction. But then where are we? If development isn’t an option, and neither is the status-quo, what course of action is left to the Philippines’ of the world? How can we achieve the holy trinity of sustainability, development and equality? If an easy answer were forthcoming, then Copenhagen would have just been a giant excuse for world leaders to spend a week daring each other to ride on the world’s oldest roller coaster. 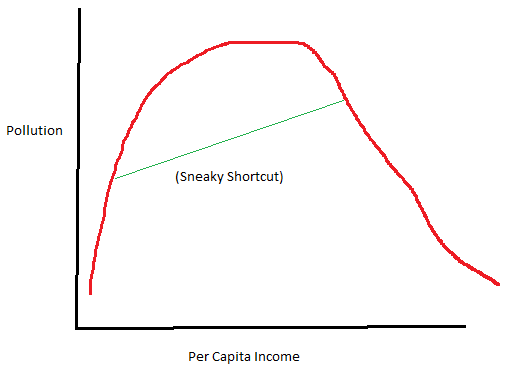 Even with my acknowledged self-interest in this outcome, I think the EKC shortcut represents the least-unappealing option open to those countries to the left of the curve, but only if those countries on top are willing to meet them there. Am I dreaming in technicolor? You bet your Filipino fish sauce I am, but I’ve seen this movie, this movie and also this one, and I know how important it is to know what I want the world to look like in case I ever develop super powers. Forget all these charts and other matters. You know that hockey is family, therefore what you should do is immediately link up with Manny P. and with his pugilistic ability and your hockey skill start the Filipino hockey league. Get on with it and forget waste management. Ian, for a young man, you possess a wisdom well beyond your years.